In a chilling close call in September 2006, a Secret Service agent inadvertently fired his shotgun as Iranian President Mahmoud Ahmadinejad was loading a motorcade, The Atlantic reports. The Secret Service called the report inaccurate. The Atlantic reported that the agent was adjusting a shotgun on a Suburban when the gun went off . 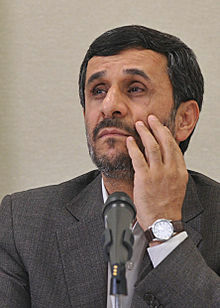 Fearing Ahmadinejad would reveal the incident – one that could be incorrectly seen as an assassination attempt – federal authorities were relieved when the president never uttered a word. The incident just became public because of an anonymous source who was there. “In September of 2007, one of our personnel assigned to the Iranian presidential protective detail accidentally discharged one round from a Heckler & Koch MP-5 into the floorboard of a Secret Service vehicle while conducting an equipment inspection. At the time of the discharge the vehicle was parked in a motorcade staging area at the United Nations. There were no protectees or foreign security personnel in the vicinity of the vehicle at the time of the discharge. There were no injuries sustained by anyone as a result of the incident. Posted: 3/21/13 at 8:59 AM under FBI, News Story.